Demineralization (Ion Exchange, EDI of CAP-DI), Softening (Lime or Membrane Softening), Sulphur Removal (Membranes) and other Technologies are used to provide Process Water required for various applications i.e. Boiler Feed, SAGD, Cooling, Cleaning, preparation fluids for drilling and others. 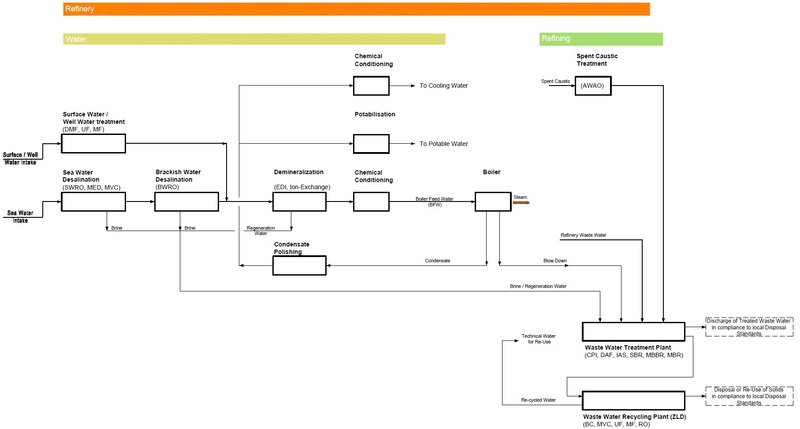 Produced Water is obtained when operating O&G Production Facilities. The amount of Produced Water per barrel of Produced Oil can be in the range of up to 15:1. Various Technologies will be applied and integrated in order to provide Solutions to treat the Produced Water with regards to the removal of Oil, Gas, Turbid matters, Sulphur, Chlorides, Barium – and Strontium compounds and others. The Produced Water will be treated in view of either Discharge, Re-Injection or Re-Use. The Solutions can include Separators, High-Performance Hydro Cyclones, Flotation Cells, Skim Tanks, Membrane Systems, Walnut Shell Filters, Carbon Filters etc. Waste Water (Effluents) that occur up-stream, mid-stream and down-stream (Exploration, Drilling, Refining, Storage and Handling) and contain a variety of impurities need to be treated for safe discharge. Depending on the composition of the effluents, a combination of different technologies is used (i.e. CPI, DAF, IGF, MBBR, AOX, WAO, Reed Bed ....). Waste Water (Effluents) that is considered to be re-used for Non-Potable Applications (i.e. Irrigation, Cooling Water, Boiler Feed, Technical Water,...) needs to be treated for safe Re-Use. Depending on the composition of the effluents, a combination of different Technologies is used ( i.e. CPI, DAF, IGF, MBBR, AOX, WAO, MBR, AMBR, RO, FO, UF, Reed Bed .... ) . Reclamation or minimizing the disposal of drilling fluids using Forward Osmosis (FO) Technology. In cases of shutdown (scheduled or un-scheduled), temporary Water and Waste Water Systems are required with the shortest possible mobilization period. These Packages for Desalination, Process Water or Waste Water will be provided on a Lease Term with Operation & Maintenance, Spares, Chemicals, Mobilization and De-Mobilization to / from the site included. For Oil & Gas Construction and Operation Camps, temporary Water and Waste Water System are required, designed for a high mobility and in modular form, in order to allow add-ons once the camps are expanding. These Packages for Desalination, Process Water or Waste Water will be provided either as capital purchase or on a Lease Term with Operation & Maintenance (including Mobilization and De-Mobilization to / from the site). The systems can be provided with remote monitoring facilities (GSM- or Web-based). Refineries or Ethylene Plants . Containing high concentrations of sulfides , phenols , mercaptanes , other volatile sulfur compounds carbonates and other organic compounds , the Spent Caustic stream creates hazards related to odour , toxicity and cannot be discharged into the biological waste water treatment plant without pre-treatment.Depending on the petrochemical process where they originate and the composition , Spent Caustic can be categorized into the following groups : Sulfidic , Naphtenic or Cresylic. We offer a patented process that operates under high temperature (205-260 degree C) and pressure (450-1,200 PSI) to oxidize organic as well as oxidizable inorganic materials in Spent Caustic Solutions to low molecular weight compounds. In the advanced Wet Air Oxidation (WAO) process, the strong driving force for oxidation is provided by both enhanced oxygen solubility at high temperatures and by maximum oxygen transfer in the liquid medium using a built-in static mixer and a recycle concept. This results in effective performance at less severe operating conditions and in capital, operating as well as maintenance cost savings. The System oxidizes organic pollutants to carboxylic acids, carbon dioxide and water, and nitrogen, sulphur and phosphorous containing compounds to nitrogen, sulphuric and phosphoric salts. Inorganic sulphides are oxidized to sulphate. The process can be used to treat a wide range of industrial effluent streams and sludge containing soluble or suspended oxidizable substances. 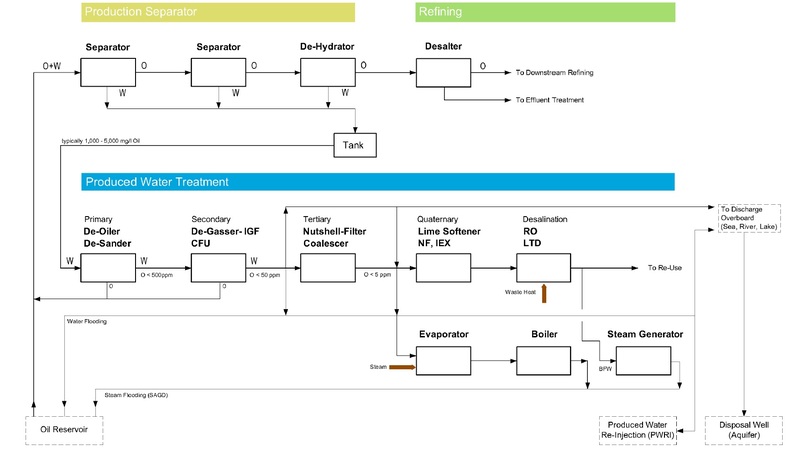 Desalination of a) sea water from open intakes or sub-sea intakes or b) treated produced water , applying Membrane and Thermal Technologies in order to provide potable water (i.e. for accommodation area ) process water (i.e. production area , boiler feed , SAGD , cooling water , cleaning water , ...) or water for re-injection . Seawater is re-injected for a) Enhanced Oil Recovery (EOR) or b) disposal. The seawater needs to be treated using filtration, deaeration and chemical injection systems. The Systems include open drain tanks and open drain caisson (sump) . The Systems include Topsides and Subsea Chemical Injection Systems. The Systems include Packaged Waste Water Treatment Plants, designed for Offshore Operation.